Preheat oven to 350 degrees. Coat a 13×9 pan with cooking spray and set aside. Cook the noodles as directed on the package. Drain and rinse in cold water. In a large bowl, mix together cottage cheese, sour cream, sugar, eggs, and egg whites, pineapple, and raisins. Using a rubber spatula, gently fold in noodles. Mix thoroughly. Pour into the prepared pan and sprinkle cinnamon evenly over the top. Bake for 50-60 minutes until light golden brown on top. Serve warm or at room temperature. We were excited to discover a Passover approved noodle to use instead of matzo in this dreamy dish. We’ve cut way down on the fat and calories by using reduced-fat cottage, fat-free sour cream, some egg whites and adding no margarine or nuts used in a regular recipe. This skinny Passover kugel has 204 calories, 1 gram of fat, and 5 Weight Watchers POINTS. 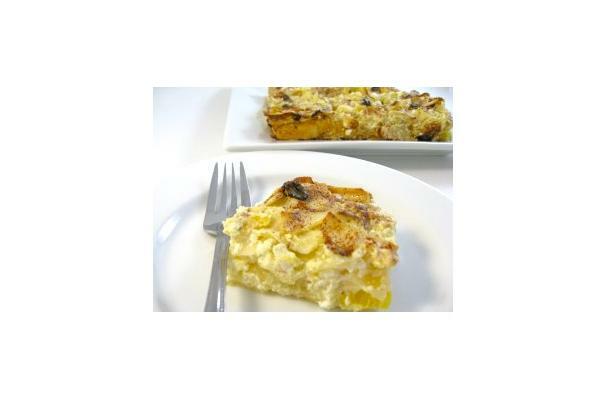 Regular kugel has 475 calories and 24 grams of fat.